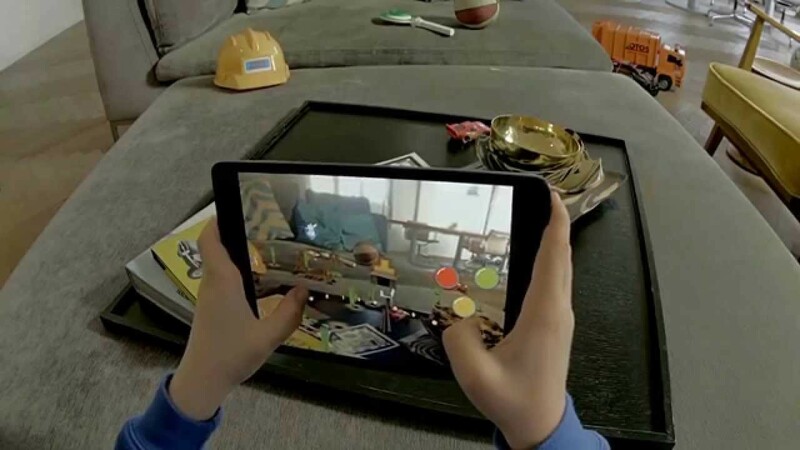 Augmented reality is the trend in the gaming industry at the moment. Do you remember the buzz Pokémon GO has generated? People just loved the idea of pokémons in the real world. This game has introduced the AR technology. Thankfully to Apple’s ARKit and Android’s ARCore you can play more augmented reality games like Pokemon GO. We have tested some of the AR games and have decided to share our experience with you. Pokémon Go is number one among the top augmented reality games. It’s the most popular and well-known augmented reality game. 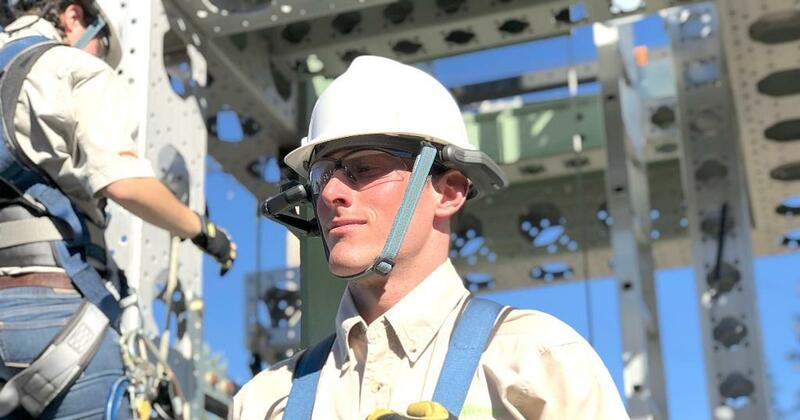 It contributed a lot to the popularization of the augmented reality technology. It was downloaded more than 500 million times, and it was one of the most used mobile application in 2016. If you are looking for augmented reality games like Pokémon Go, we can recommend you Ingress. 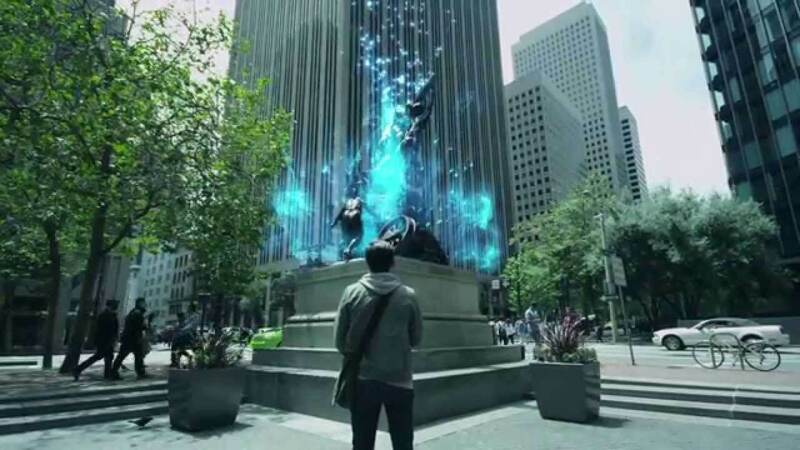 Ingress is an AR game created by the developers of Pokémon Go. It’s a science-fiction AR game, which has a story behind. You can choose one of two teams, The Enlightened and the Resistance. In this game, your mission is to catch energy from portals, which are located near famous real-world monuments, parks, and statues. 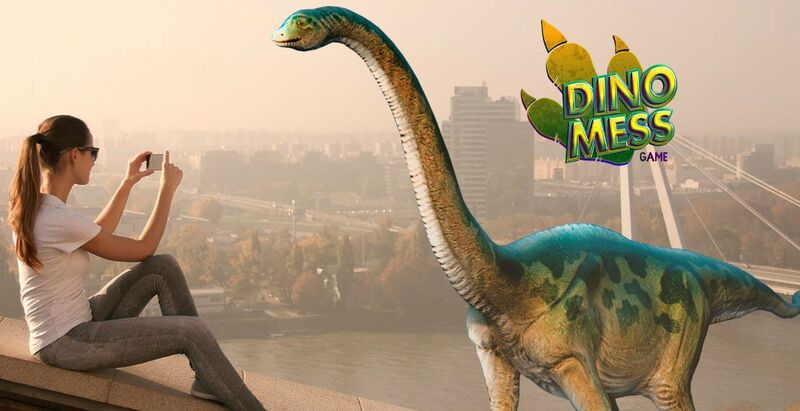 DinoMess is an AR mobile game about dinosaurs. 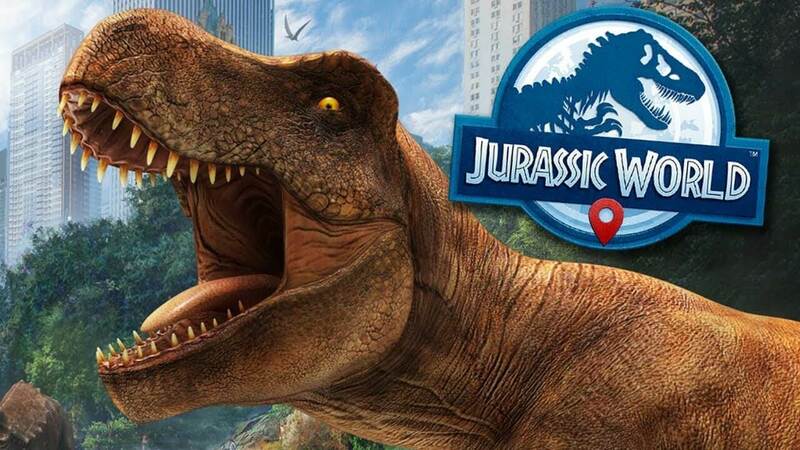 You can hunt for 24 different types of dinosaurs, you can train, feed and level them up using DNA and make them participate in the battles using augmented reality. There are also such features as supplies, egg hatching, evolution. The Walking Dead: Our World is a location-based augmented reality game. You need to fight zombies in the real world and save the planet from the zombie apocalypse. 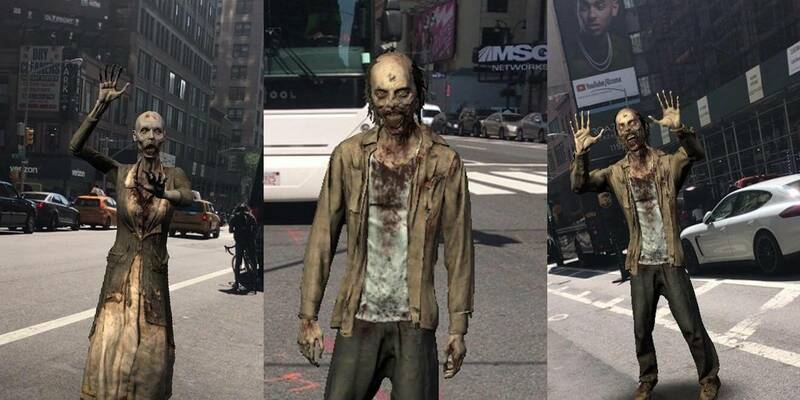 The AR game is based on the popular Walking Dead TV show, and players can collect legendary items from this show. 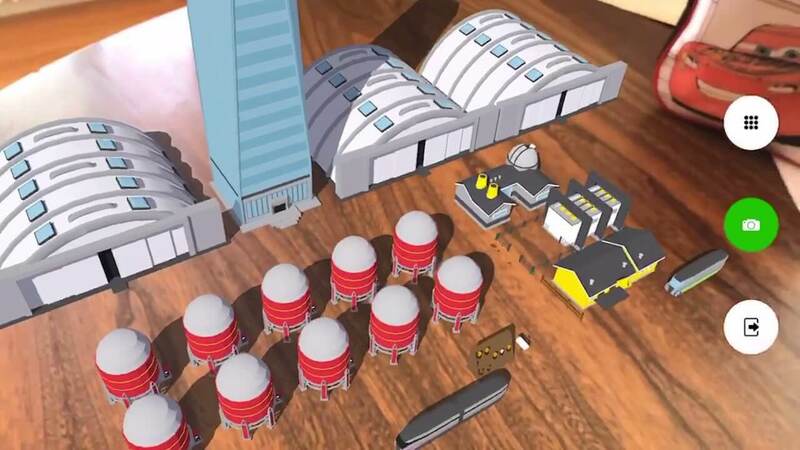 Resources is an augmented reality game with the elements of economic simulation. The mission of the game is to set virtual mines in the real-world environment in order to extract resources, sell them and make money so that you can get the higher rank. There are different types of resources, but you need to protect your mines from other people. 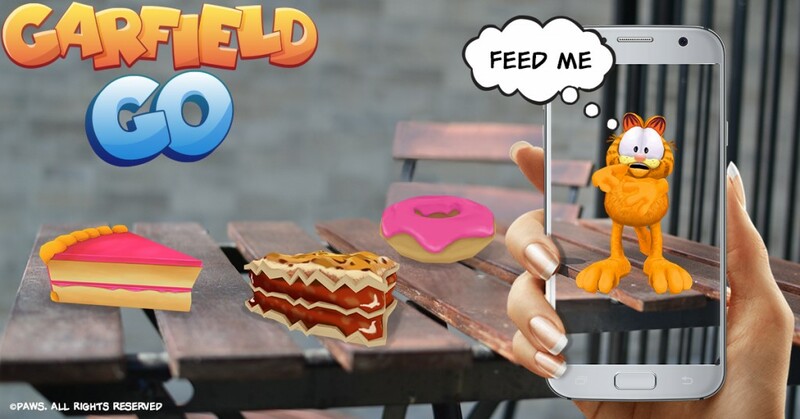 If you like AR games like Pokémon GO, you definitely should try Garfield Go, a hunting game where a well-known cat is looking for treasures. This AR cat is very lazy. It’s not so easy to make him go on the hunt, so you need to give him his favorite dishes, so he starts to look for treasures. 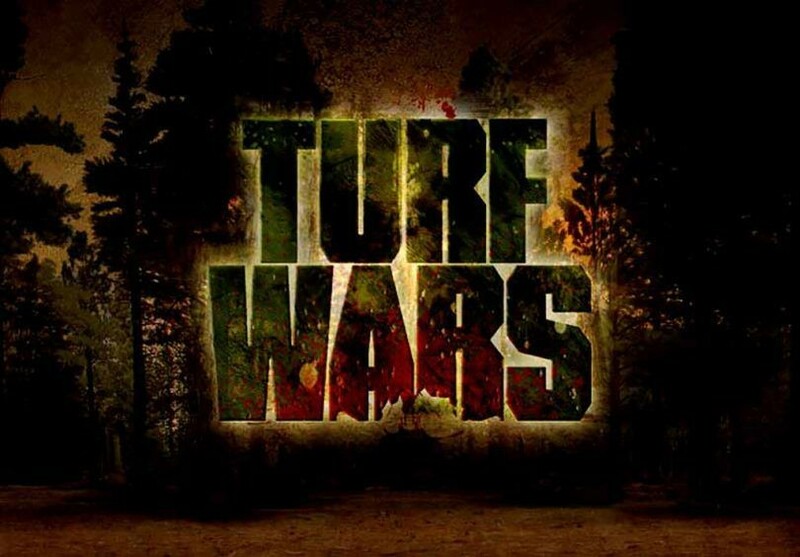 Turf Wars is an AR mobile game in a mafia style. You need to create gangs, take control of real-world restaurants, schools, etc. If you are strong enough you need to charge other players fee for the safety of their territory. It’s like the board game Monopoly but in the augmented reality. 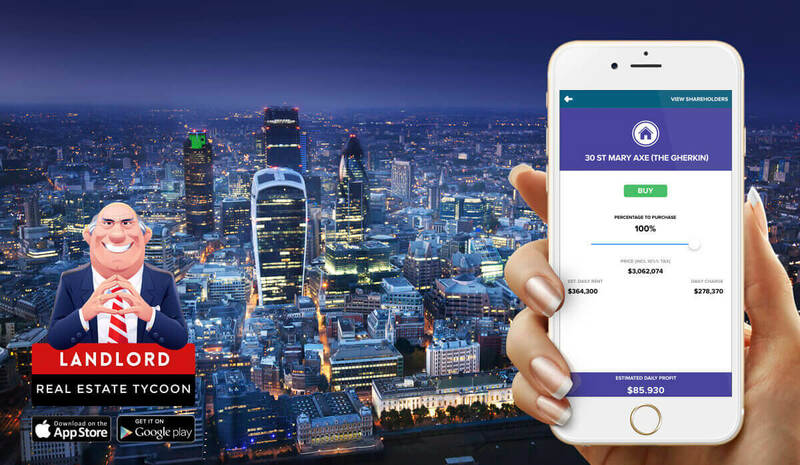 You can buy, rent and sell existing real-world properties using AR. The price of the property in the AR game depends on the popularity of the property. It can be a restaurant in the city center or well-known attractions like Statue of Liberty or Eiffel Tower. 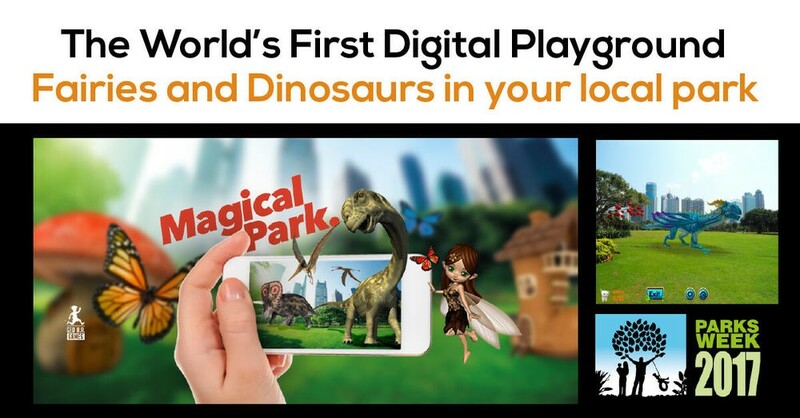 Magical Park is an augmented reality game for kids. 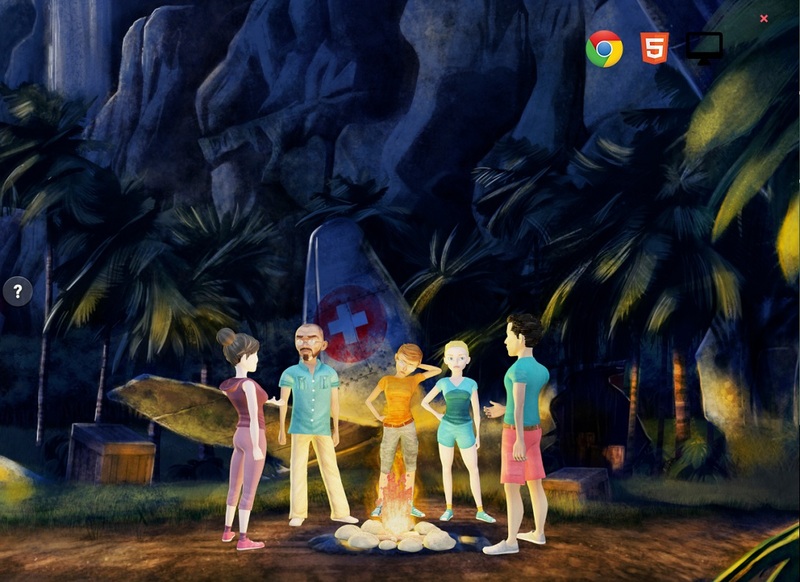 The game has two augmented reality parks where kids can play, Augmentia and Prehistoria. Augmentia is inhabited by fantastic creatures like fairies and dragons and Prehistoria by the dragons. The mission of the AR game is to collect fantastic creatures in the first park and eggs of the dragons in the second. 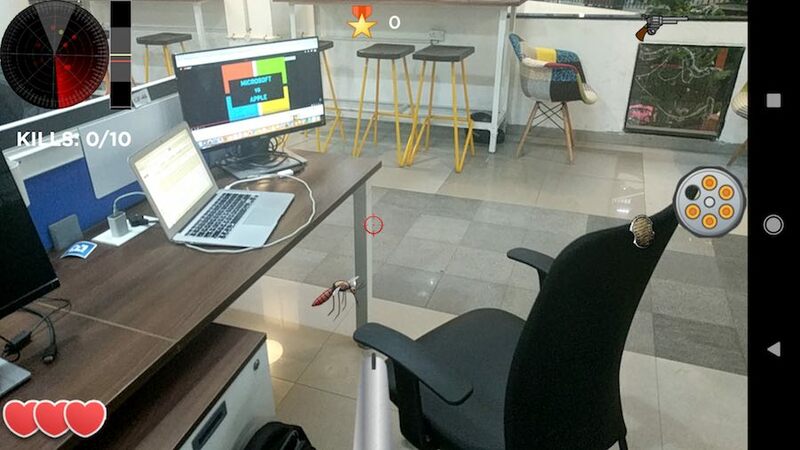 The mission of this augmented reality game is to kill mosquito and pests with different types of guns. You will see the insects from your phone’s camera. Each of them has different characteristics, and you need to know it in order to kill as many insects as possible and win. You can do it with different types of guns like a shotgun, machine gun, flamethrower, pistol. This AR game is a must-download for those who love horror movies. 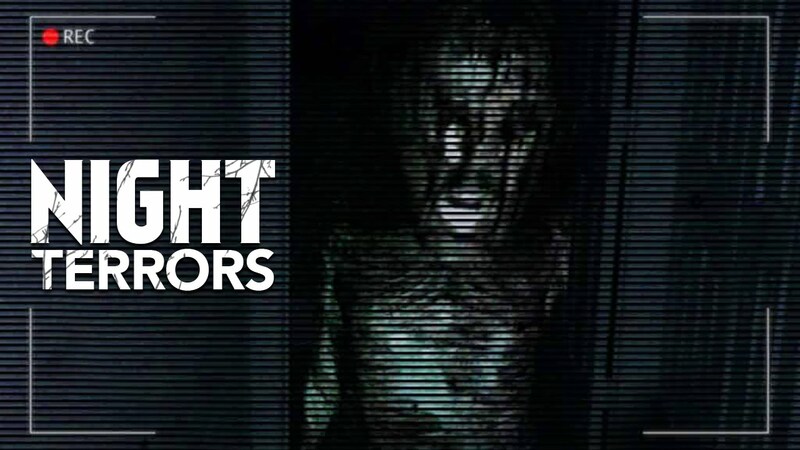 It gives you an opportunity to see ghosts which will frighten the life out of you. But you need to play in the dark with your headphones to make the environment scary. 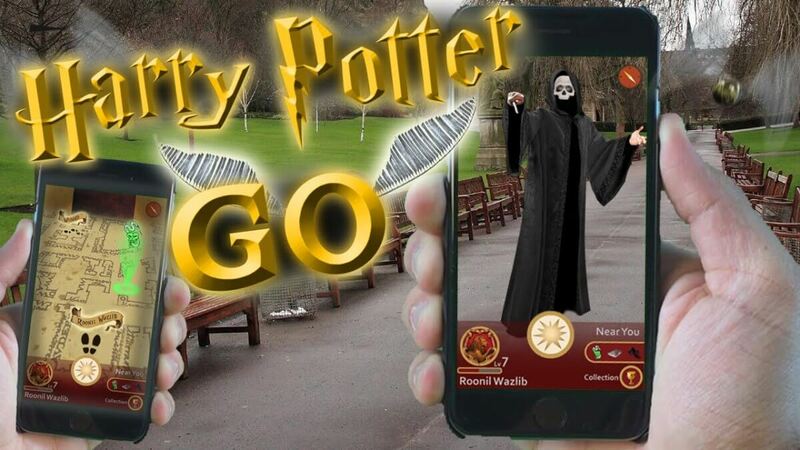 Harry Potter: Wizards Unite is the most anticipated augmented reality game that will be released later this year. 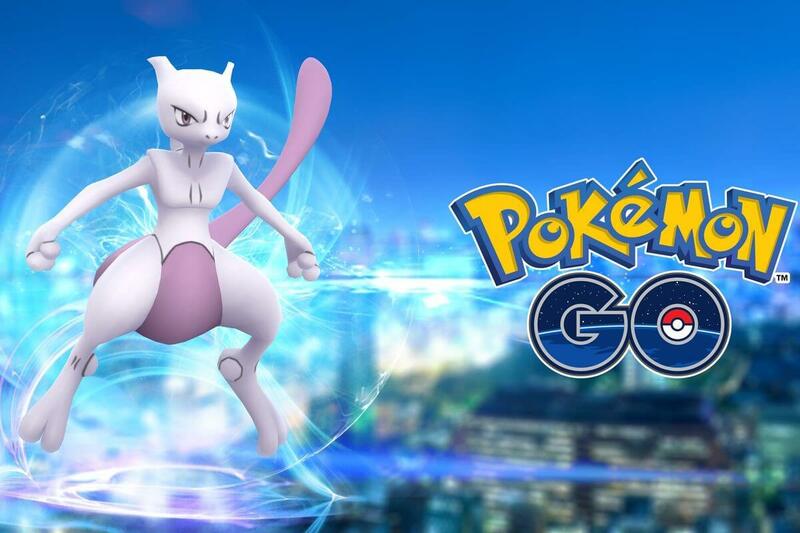 The AR game is developed by Niantic, the creators of Pokémon GO, in collaboration with Warner Bros. In this game, you need to find and destruct artifacts, encounter magic beasts, and cast spells. 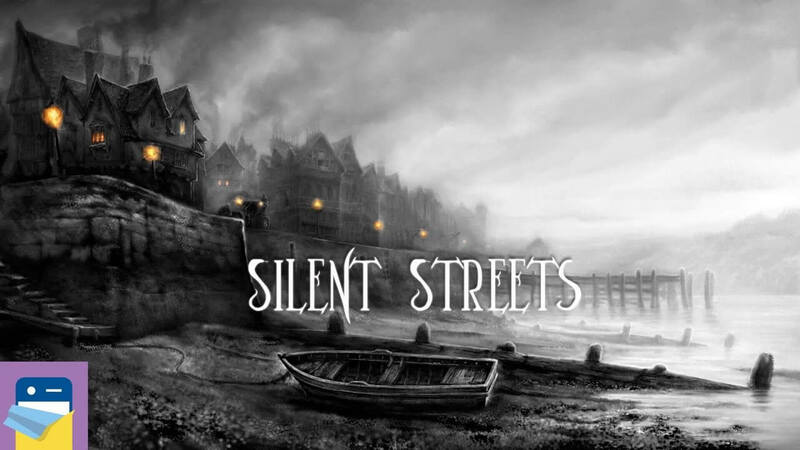 Silent Streets is an augmented reality game which gives you a possibility to become a detective. The AR game immerses you in the Victorian Era. You need to interrogate suspects and conduct your research to solve crime puzzles. You can see a crime scene in augmented reality, and it makes this game gripping. World Brush is a wonderful iPhone AR experience which lets you paint on the world and leave paintings and private messages to friends. It’s one of the top augmented reality games because it’s connected to GPS, so the painting will be saved at the precise GPS location. If you want to leave a private message, nobody else can see it. Otherwise, if your message is not private, other users can like or dislike it. 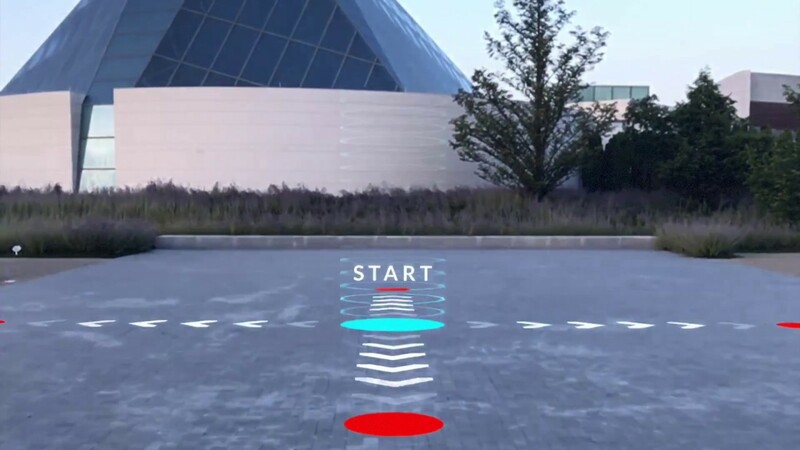 AR Runner is a runner that should be listed among the top augmented reality games. You need to play outside and run through checkpoints setting new records. AR Runner is a fun way to do sports and start to work out. The game has four modes. Crime Scene: AR is an Android augmented reality game for those who like to watch detective movies and films. In this AR game, you play the role of detective and analyze evidence to find the main suspect. Do you want to find an AR game like Pokémon Go? If you are a cat lover, we would recommend you Cats GO. It’s an augmented reality game where you need to find kitties in the city using GPS. The goal is to catch as many cats as possible. Egg is an Android augmented reality game which can be used as a time waster. This game contains AR elements, but you can play most of the game on your smartphone. 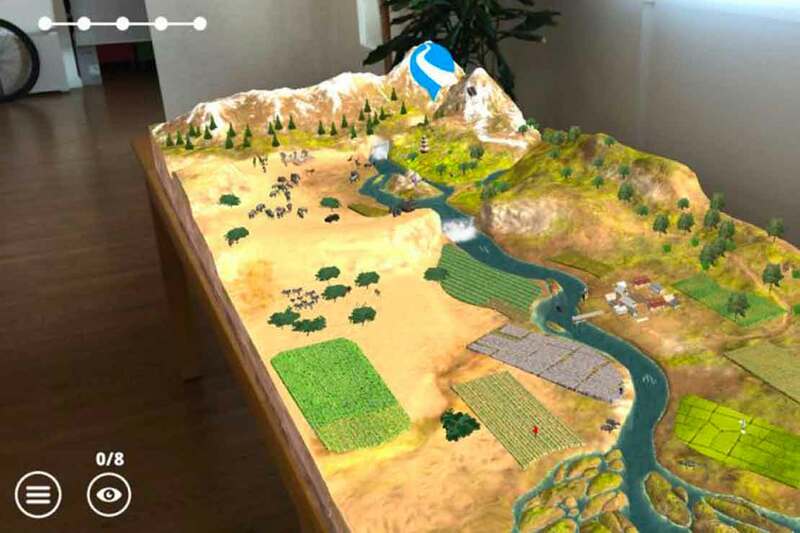 In this augmented reality game, you can build farms and gain resources. You have dozens of different items, shipping vehicles, and hen houses. You need to complete 12 missions. Zombie Go is one of the top augmented reality games about zombies. Zombies pop up out of nowhere, and you need to kill them using different weapons. It’s an AR game like Pokémon GO but you are not looking for Pokémons, you are fighting zombies instead. 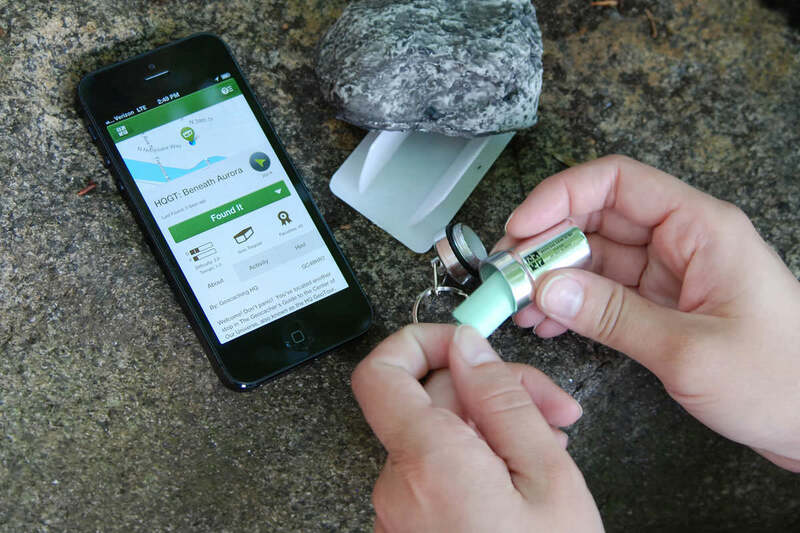 Geocaching should be listed among the top AR games. It’s the world largest treasure hunting augmented reality game. You need to look for geocaches following instructions. It can be hidden in your city or some remote area or even in the mountains or in the forest. 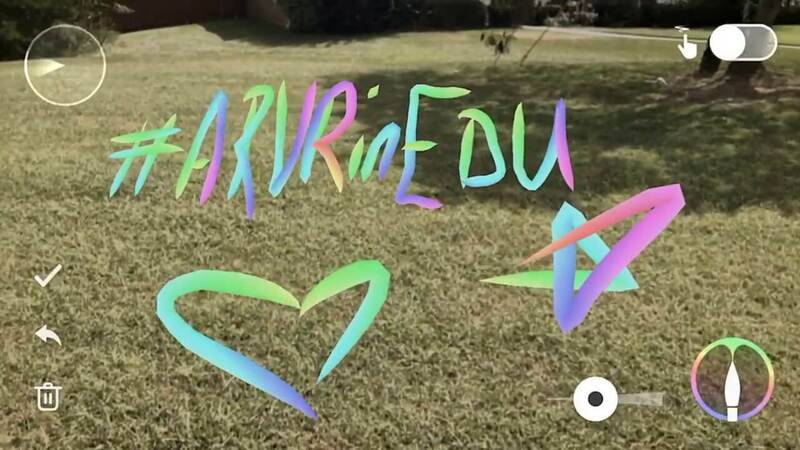 The AR app has fans almost in every country around the world. Invizimals: The Resistance is another AR game like Pokémon Go. Your mission is to find fantastic creatures called invizimals. There are 150 invizimals that you should save by fighting the army of Xtractors. 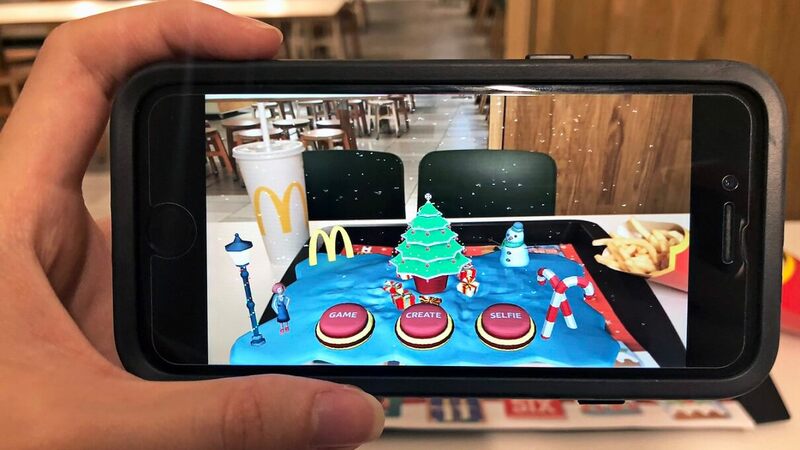 This AR game has won numerous awards for its innovative gameplay at the different expos around the world (Canadian Video Game Awards, Grand Prize Winner for Best Augmented Reality Game, Finalist for Best Augmented Mobile App at Augmented World Expo in Silicon Valley, California). 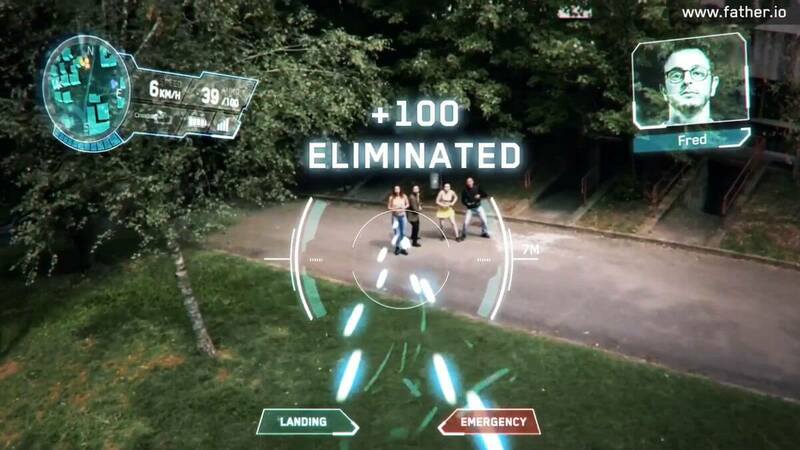 In this augmented reality game, you should stop the alien invasion and fight aliens in different real-world locations. In order to achieve this goal, you are supposed to use different tactics and participate in battles. It is one of the top augmented reality games about aliens. GNOG is an augmented reality game for kids of all ages. It’ possible to play it using AR mode or not using it. Smooth gameplay, cool soundtrack, detailed graphics enables this game to take its place among the top augmented reality games. This AR game consists of the puzzle boxes featuring heads. The mission is to find out a solution without any instructions by swiping, poking and prodding. Kazooloo DMX is an augmented reality game which brings monsters to real life. It’s an incredible AR game for children, which transforms the room in the battleground. This augmented reality game immerses the kids in their favorite cartoons about monsters. And what can be better? Conduct AR! 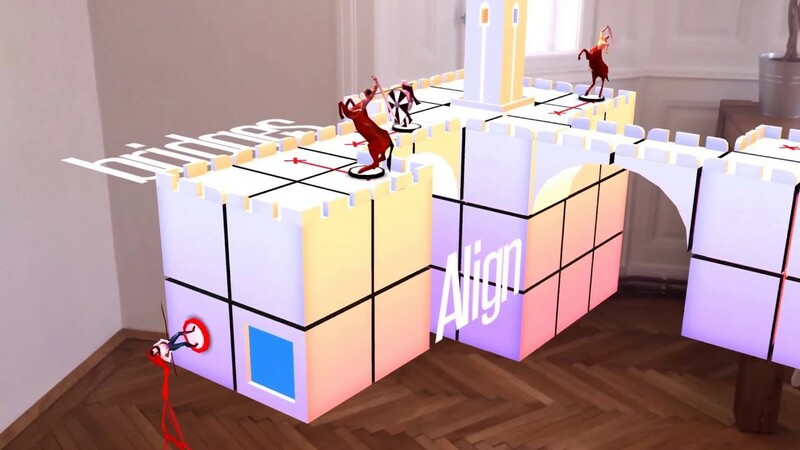 is an augmented reality game you can play on your table. It’s a train strategy game where you need to keep the situation under control at the railway station in the Wild West. The gameplay is intuitive and simple enough, but it becomes more complicated as you level up. It is an iPhone augmented reality game. You can put a net in your room and test your skills. It’s one of the top augmented reality games because it has a multiplayer mode so you can compete against your friends or people from all over the world. Euclidean Lands is a beautiful augmented reality game. It’s perfect for you if you like puzzles. You need to solve AR puzzles in order to defeat your enemies. The game has 40 challenging levels and various enemy types. WWF Free Rivers is a great educational augmented reality game. The AR app shows the importance of the river systems for the human civilization and how human actions can affect the water balance. Using ARKit technology the user can take a look at the rivers systems all over the world. Looking for AR games like Pokémon GO, but with giant dinosaurs? You should wait for Jurassic World Alive which is expected to come this year. 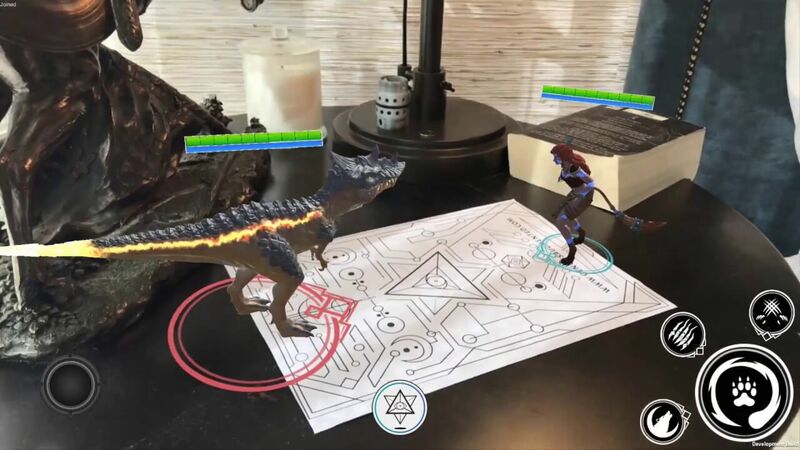 In this augmented reality game, the user will discover dinosaurs by locating them, you will interact with them, collect and use in the battles with other players. 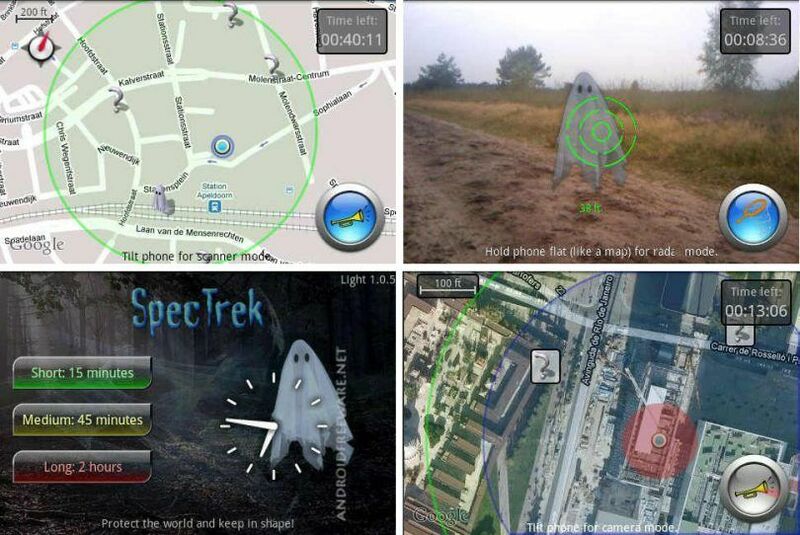 SpecTrek is a runner-up in the “Android Developer Challenge II,” so it’s for sure one of the top augmented reality games. The AR game brings ghosts to life, and you need to capture them with your smartphone in order to save the world. You can also follow your statistics: records, titles, awards, etc. AR Smash Tanks! is a perfect time killer. It’s an augmented reality game with multiplayer options. The mission of the AR game is to smash tanks into one another and fight your enemies. You can use explosive weapons and get power-ups to eliminate your opponents. 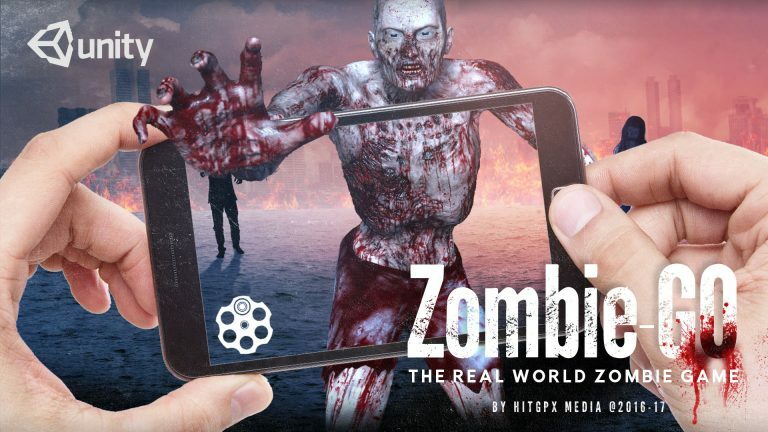 AR Zombi is another augmented reality game for those who love horror films and zombies. The mission is to protect your house from their attacks. Zombies pop up whatever window you point your phone toward, and you need to find a way to prevent them from getting into your house. You need to collect power-ups to buy guns and survive. 33. 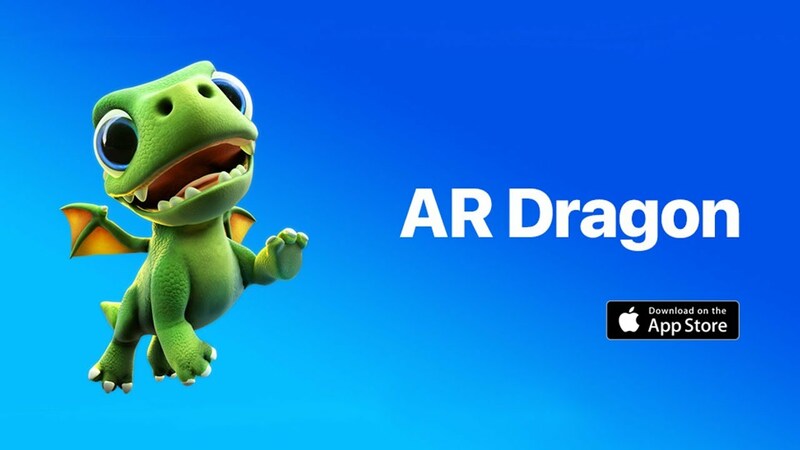 AR Dragon: Augmented Reality Virtual Pet Simulator! Love pet simulators? In this augmented reality game, you need to take care of the cutest dragons you’ve ever seen. Your AR dragon is unique and it grows older every day, so you need to feed it and entertain. You can also collect different toys and fancy skins for your pet. 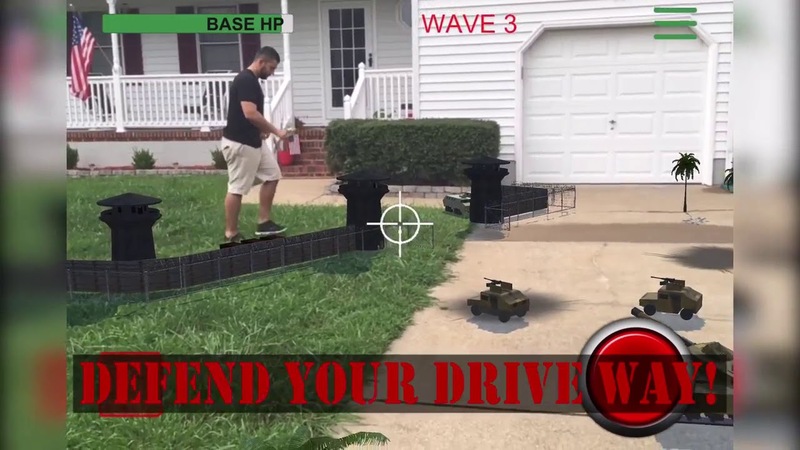 This AR game enables you to make a battleground on any flat surface in your house. The mission of the game is to destroy the enemy’s helicopters and tanks. The augmented reality game gets more difficult as you level up. You can use the scaling function to increase the size of your battleground and play outside. 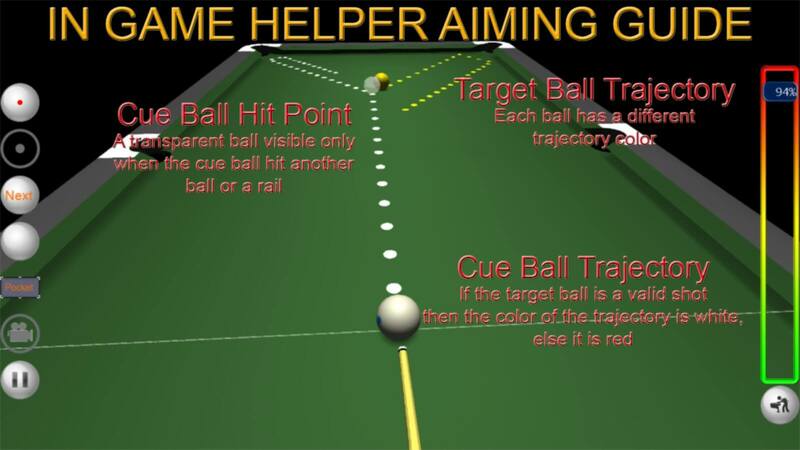 Kings of Pool is an AR mobile game, which allows you to play against the top billiard players in the world. The mission is to win as much money as possible and become the wealthiest player. 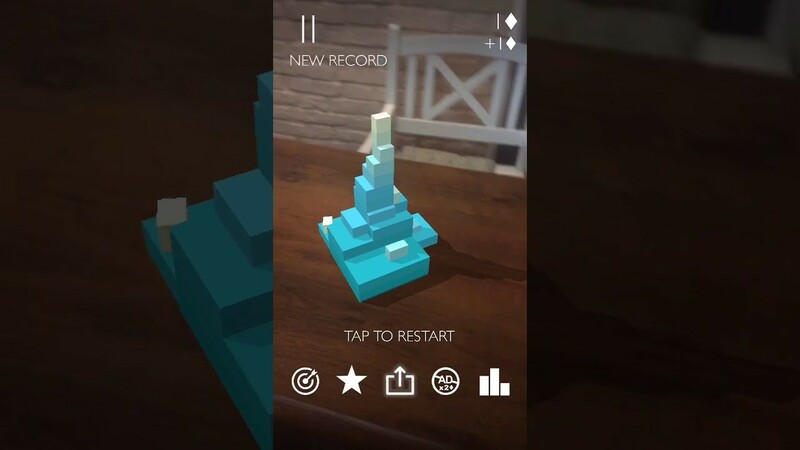 StackAR is an augmented reality game that you can play if you need to kill time. Actually, you can play it without AR mode too. The mission is to stack up the blocks as high as possible and increase your score. 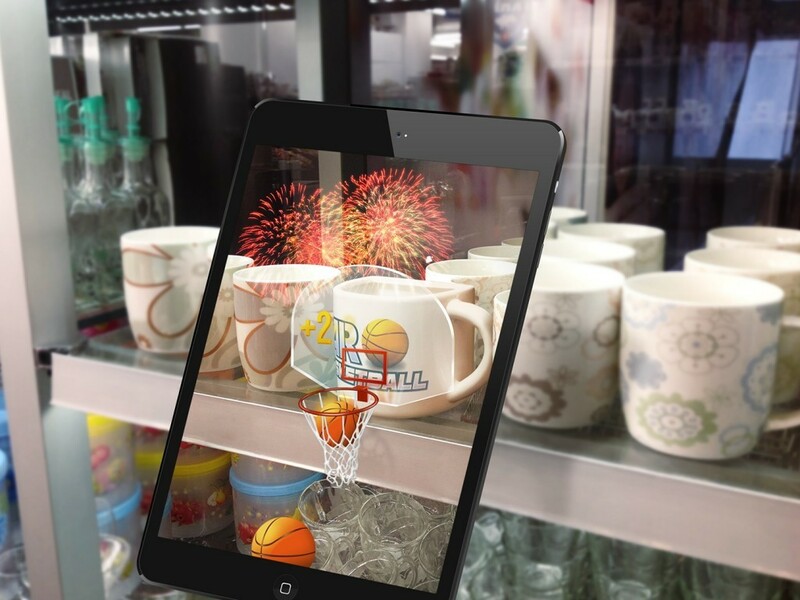 The advantages of this augmented reality game are a simple gameplay and beautiful graphics. What makes this augmented reality game interesting is the plot. 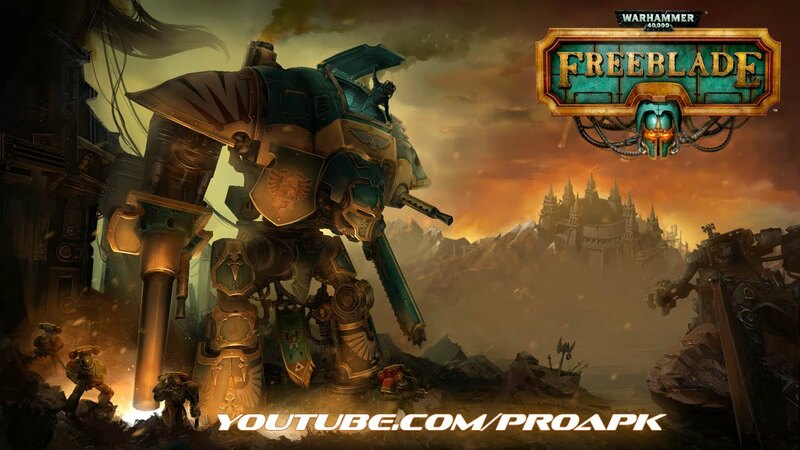 The forces of Chaos destroyed the noble house of a young Imperial Knight, and the knight wants to take revenge. You can customize your hero and take part in the AR battles against other players to obtain the highest score. It’s one of the top augmented reality games we highly recommend you because of its smooth gameplay, stunning visual effects, and realistic graphics. 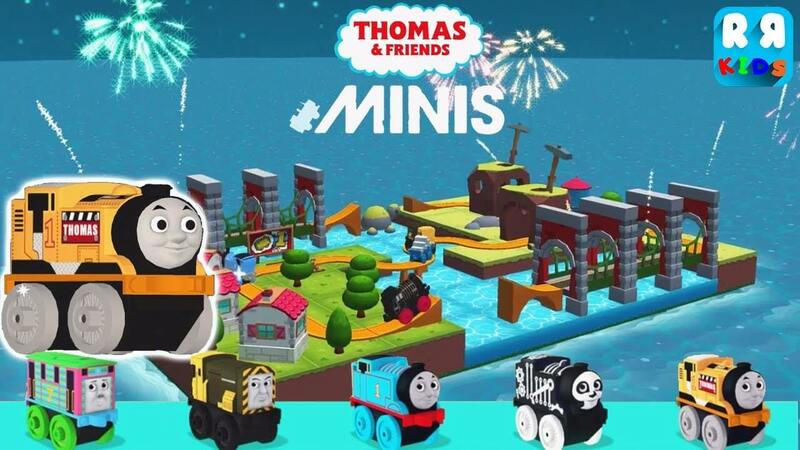 Thomas & Friends Minis is a fun iPhone AR game for kids. They need to create their own train set. The customization options are endless. They can develop waterslides, frozen loops, rainbow bridges and more. 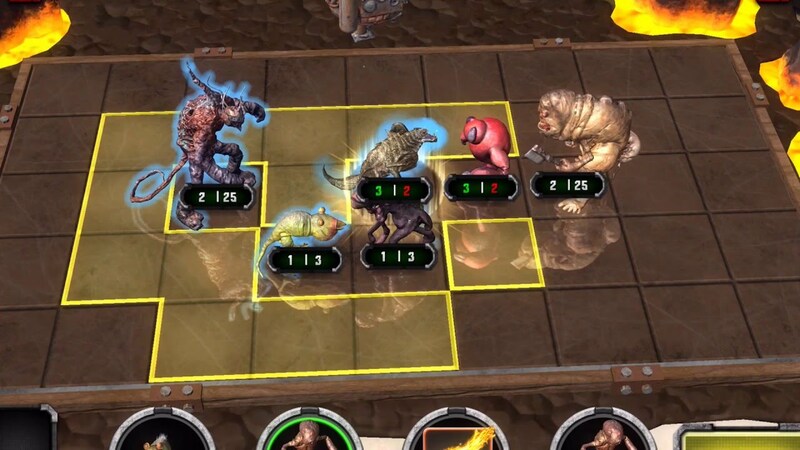 HoloGrid Monster Battle is an augmented reality game inspired by the Star Wars, in particular by the HoloChess scene. It’s a strategy AR game combining the features of Collectible Card Games, Chess and other strategy games. Mobbles is an AR game like Pokémon Go, but you need to capture mobile monsters, mobbles, instead of pokémons. There are over 250 mobbles you should catch. You can customize them, feed, play and use in the AR battles. Genesis Augmented Reality is the 7th most Crowdfunded mobile game of all time, and this fact makes it one of the top augmented reality games. The main character is called Riftlord and his mission is to protect Universe from the chaos. In order to bring heroes to life, you need to print special AR anchor and point your phone’s camera at it. The Code Runner is one of the best spy augmented reality games which combines GPS and storytelling. You need to take the real-world streets to complete the missions. You will have different tasks as hacking, spying and solving puzzles. My Tamagotchi Forever is a legendary game of 90’s in AR. It’s an AR mobile game where you need to feed your character, take care of it and keep it happy. You can buy new items and play with them. 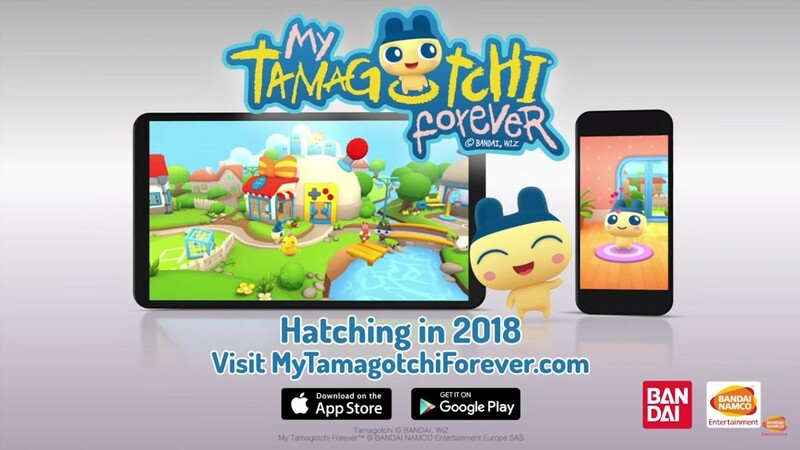 Depending on how you treat it, your AR Tamagotchi will transform into different characters and can become a celebrity, a scientist or a musician. Your Tamagotchi character can play with his friends and collect coins to increase its score. 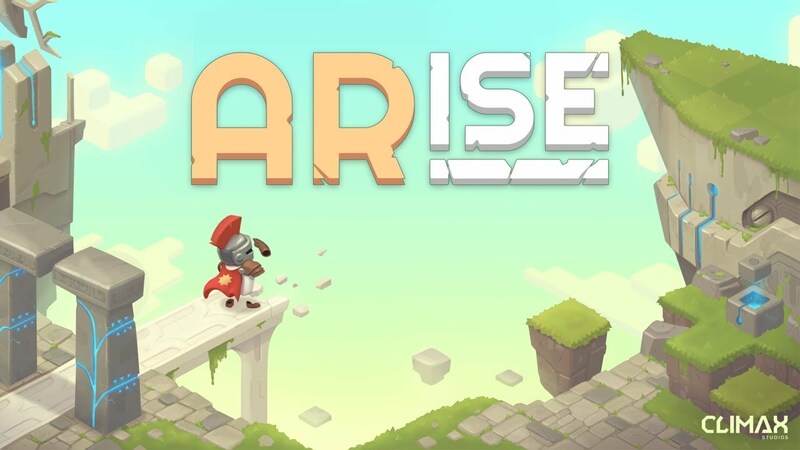 ARise is an iPhone AR game where you can play with 3D puzzles. You need to solve them in order to create paths and complete each level. This augmented reality game is challenging because it requires thinking out of the box. You will never get bored because new puzzles appear every month. 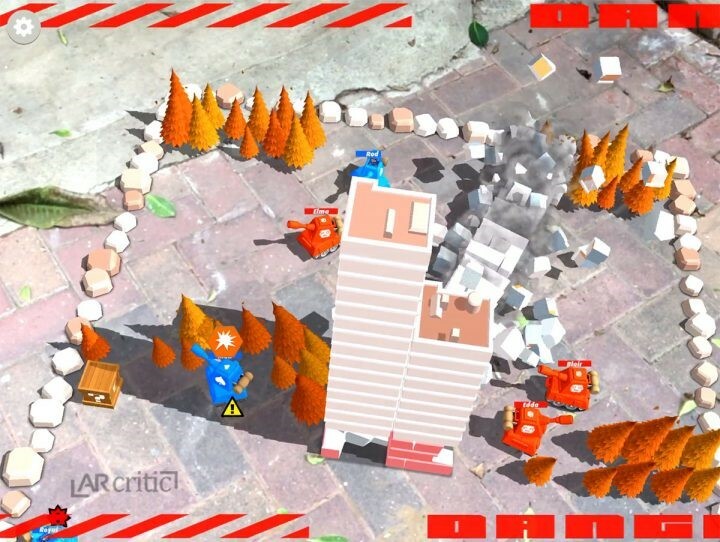 AR Invaders is an augmented reality iPhone game about the alien invasion. It’s a simple shooter but augmented reality makes it more compelling. This game is the winner in “International Mobile Gaming Award” so it’s definitely worth playing. It’s one of the top augmented reality games for kids of 6-8 year old. It was downloaded more than 100k in over 20 countries. The main character is the car Wheely which needs to complete different missions. This AR app is marker-based, so you need to print different images, point your camera’s phone at them and new missions will open in augmented reality. Alien AR is another augmented reality game on the alien theme. Your goal is to survive, and you need to complete seven missions in order to achieve it. The AR game is a part of the Alien movie franchise. Father.IO is worth to be listed among the top augmented reality games because it’s the first time you can play person shooter in AR. 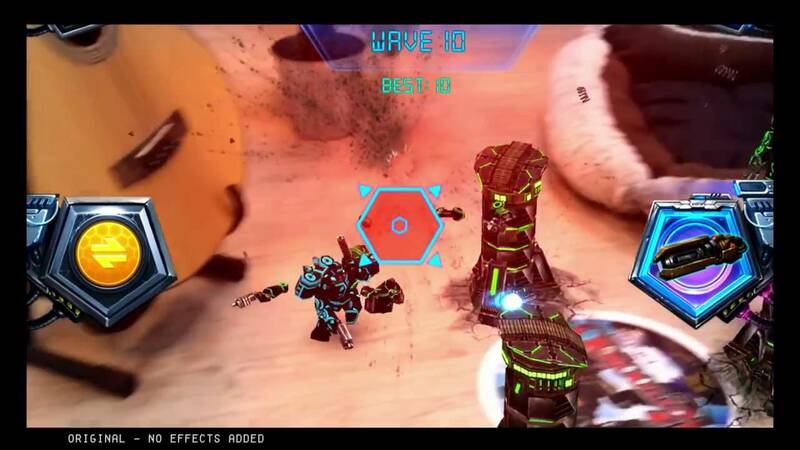 You can also play it with your friends in the multiplayer mode, if you buy an Inceptor. 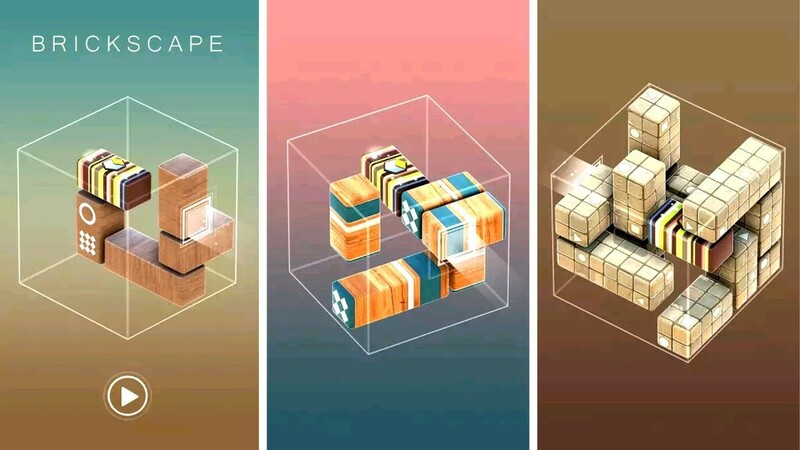 Brickspace is an AR mobile game where you need to assemble 3D puzzles. The game is not very complicated but users like it because of its smooth gameplay and high-quality graphics. It’s available without AR, but you will definitely have more fun playing it with your surroundings. Knightfall AR is an augmented reality game with a riveting plot, especially if you are keen on medieval history. In this game, you are one of the Knights Templar who is striving to protect the Holy Grail. 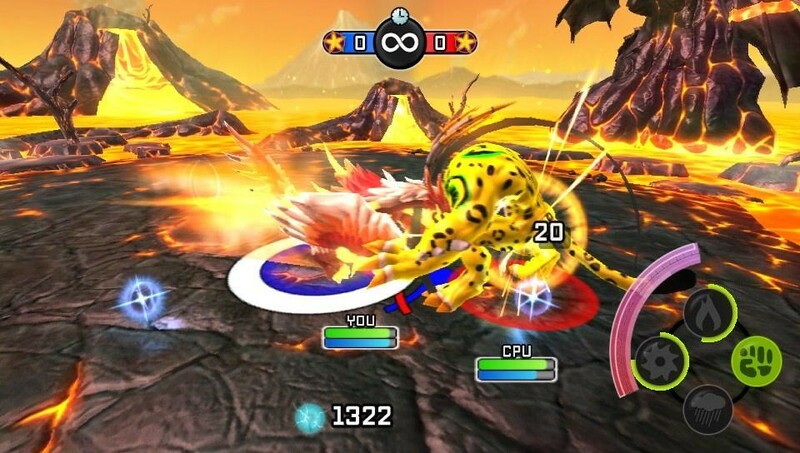 The battles take places on your table in AR. Besides, you have an opportunity to learn interesting facts about soldiers and weapons in the Middle Ages. We hope you find this article helpful and you will find an augmented reality game for your taste. So you can fully enjoy new AR features on your smartphone. Have fun!